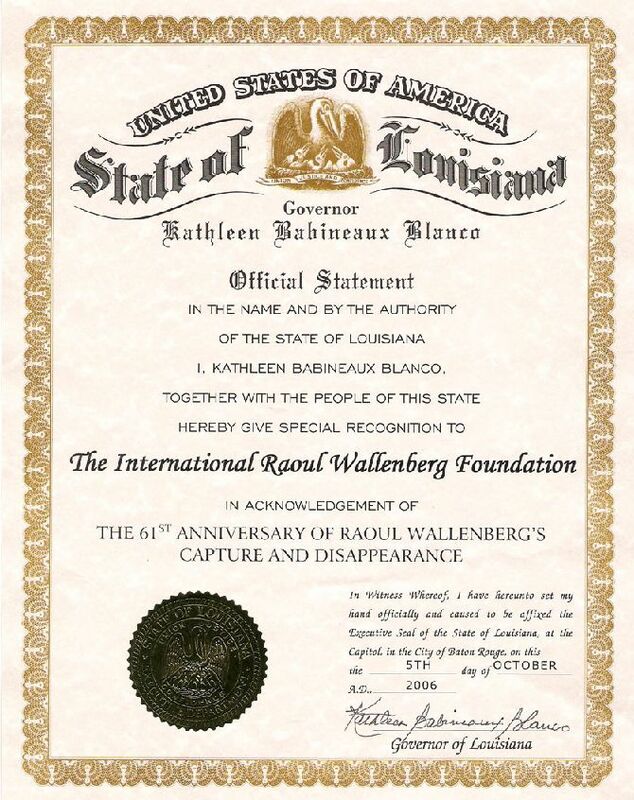 Governor Kathleen Babineaux Blanco signed an official statement recognizing the International Raoul Wallenberg Foundation in acknowledgement of the 61st anniversary of Raoul Wallenberg’s disappearance. Raoul Wallenberg was the Swedish diplomat who disappeared in January 1945 after saving the lives of tens of thousands condemned to certain death by the Nazis in Hungary during World War II. He was captured by the Soviet troops who took control of Budapest in January 1945, and was never seen again. On October 5th 1981, Raoul Wallenberg became the second person in history to be awarded Honorary U.S. Citizenship. The International Raoul Wallenberg Foundation is a public non-profit non-governmental organization with branches in New York, Buenos Aires and Jerusalem. Its mission is to develop educational programs and public awareness campaigns based on the values of solidarity and civic courage, ethical cornerstones of the Saviours of the Holocaust. The Foundation recently launched the international campaign ”Let’s Bring Raoul Home,” which calls for distinguished personalities to write letters directly to Vladimir Putin, asking for the release of vital information on Wallenberg’s case. Letters have been written by Nobel Prize Laureates, Heads of State and Wallenberg’s family. The initiative also counts with the support of more than 22,000 signatures of individuals who signed the ”100,000 names for 100,000 lives saved by Wallenberg,” aimed to uncover Wallenberg’s fate. More than one hundred Heads of State, Nobel Prize Laureates, Governors and distinguished personalities from all walks of life accompany the IRWF in this singular enterprise that aims at educating the younger generations on the exemplary behavior of the Saviors of the Holocaust.